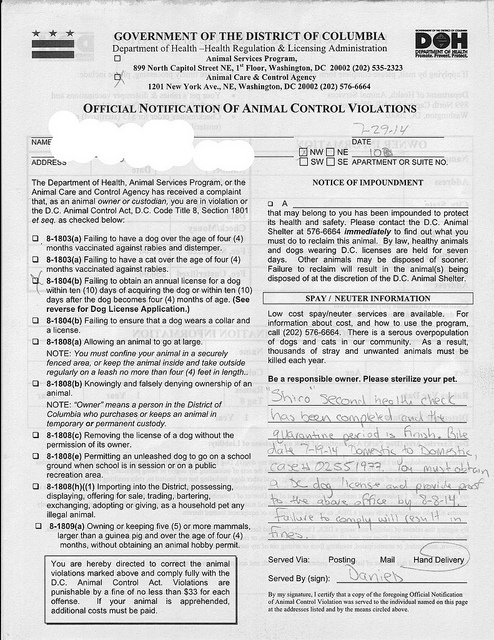 Today when Officer Daniels came to do the second health check as part of the quarantine of my dog Shiro, who was bitten at a dog park by another dog [which I reported], he left with my spouse an Official Notification of Animal Control Violation. I informed to him that I had renewed Shiro’s dog license and that the Health Regulation and Licensing Administration, in a letter, said that they had changed their system for dog tags and that the old tag will remain active unless it is lost. Officer Daniels said that a new tag is issued annually and that I need to present that to him or could be fined. There is obviously tremendous lack of communication between two offices, the Health Regulation and Licensing Administration and the Animal Services Program, in the same department, Department of Health, located in the same building. Is there a new tag? Why was I not given the new tag and instead given a letter with information that Officer Daniels says is incorrect? I need to solve this issue as soon as possible because I do not want to live with the threat of some government official taking my dog away from me due to some misunderstanding or misinterpretation that can lead to any form of abuse, which seems to be common in the District.